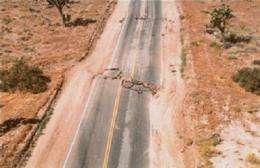 A magnitude 7.3 quake in Landers, Calif., in 1992 killed one person. Credit: Southern California Earthquake Data Center. Scientists have well established that big earthquakes can trigger other big quakes by transferring stress along a single fault, as successive earthquakes in Turkey and Indonesia have shown. But some powerful quakes can set off other big quakes on faults tens of kilometers away, with just a tiny nudge, says a new paper. Christopher Scholz, a seismologist at Columbia University's Lamont-Doherty Earth Observatory, explains how: the faults are already synchronized, he says. Scholz argues in the most recent issue of the Bulletin of the Seismological Society of America that when a fault breaks, it may sometimes gently prod a neighboring fault also on the verge of fracturing. 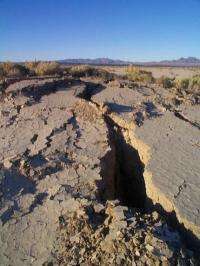 The paper finds evidence for synchronized, or "phase locked," faults in southern California's Mojave Desert, the mountains of central Nevada, and the south of Iceland. Drawing on earthquake patterns as far back as 15,000 years, the paper identifies strings of related earthquakes, and explains the physics of how faults separated by up to 50 kilometers, and rupturing every few thousand years, might align themselves to rupture almost simultaneously. "All of a sudden bang, bang, bang, a whole bunch of faults break at the same time," says Scholz. "Now that we know that some faults may act in consort, our basic concept of seismic hazard changes. When a large earthquake happens, it may no longer mean that the immediate future risk is lower, but higher." Entrainment can also happen when faults lie relatively close, between 10 and 50 kilometers apart, and are moving at comparable speeds, Scholz says. As faults break successively over time, their cycles may eventually fall in sync, a process described in the paper by the mathematical "Kuramoto Model." The Landers quake may have triggered another big quake, seven years later, at Hector Mine near Joshua Tree National Park. Credit: University of California, San Diego. Ross Stein, a geophysicist at the U.S. Geological Survey, who was not involved in the study, questioned the paper's wider significance. There is "good" evidence for historic earthquake sequences, and "possible" evidence for prehistoric sequences, he said, but those quakes make up a minority of earthquake events. "In nature, random signals often fall mysteriously in step." Why this attack on the very foundations of experimental science? Is it because serious scientists are now starting to realize that various parts of the solar system - the Earth, the Sun, and the other planets are gravitationally, magnetically and electrically connected - despite the false claim that Earth's climate is immune to cyclic changes in the Sun?